Lately there has been a lot of discussion about getting the first job after finishing the MLS program. There have been many dozens of emails posted on NEWLIB-L (See “How Did You Get Your First Librarian Job?” thread) and LITA-L listserv (See “What advice would you give someone considering LIS school?” thread). Not only current MLS students and recent graduates expressed frustration and anxiety about a long job search process during the depression period but also many experienced librarians shared thier own experience, advice, and wisdom. Other librarians offered practical tips and resources. (See the recent post in Library Scenester and four other posts mentioned there: Kiyomi Deards’ phone interview advice, Julie Strange’s 10 tips for landing an interview, Patrick Sweeney’s 5 tips for successful librarian interviews, and Bobbi Newman’s resources on becoming a librarian). In those listservs, some asked those who have recently gotten a job to share how they prepared themselves and succeeded in managing difficult interviews. In response to this, many librarians emphasized the importance of networking and being professionally involved through library organizations such as ALA, SLA, etc. While I wholeheartedly agree that this is an excellent advice, I could not help thinking about myself while attending a MLS program. I had almost zero networking and was absent in about ninety-five percent of school activities that were going on whether it was a library association student chapter event or writing a publication in a newsletter or a LIS journals. I was working full-time, barely managing two evening or weekend classes a semester at Simmons. Often my primary concern while I was on-campus was how to feed and caffeinate myself during the short and precious time before an evening class immediately after work. Going to a professional conference or actively participating in school activities was never a real possibility. So if you are like my past self in these respects and cannot change your pattern of behavior due to various personal and family-related reasons, what can you do to increase your chances of getting a job after the MLS? I think that work experience is one thing that speaks a volume about a candidate’s potential, and as such every job-seeking soon-to-be librarians should have a compelling portfolio of what kinds of library work they have done and how that fits with their interests and the positions they seek as a MLS program graduate. One should start working at a library as soon as getting into a MLS program, if not before. Library paraprofessional positions rarely require being in a MLS program. Why not test water first before committing oneself to a two-year study when the market prospect is less than ideal? Just as important as getting library work experience is doing the kind of work that one “wants to pursue” after the MLS. If one’s dream is to be a systems librarian, working at a circ desk would add very little in the job market no matter how long the work at the circ desk has been and how good one did the job. If it is not possible to get a job or work as a cataloging or a reference assistant while you are in school but cataloging or reference is the job you would like to go for after the MLS, you should consider other ways to get that type of work experience such as volunteering and part-time and/or term-time positions. In reality, MLS programs provide mostly vocational education, and as such, work experience often trumps high GPAs and other academic achievements. Going for the work experience in the field one wants to be is THE type of risk and investment that any future librarian must take and make. I know it is hard to ditch or work in addition to a full-time non-library job (often with benefits!). But getting relevant work experience is not an option but a must for a post-MLS librarian position particularly if you are attending a MLS program part-time and cannot afford investing time in networking and being involved in professional organizations as a student . In that sense, all pre-MLS positions are essentially temporary positions as long as one aims to become a professional librarian. It is also good to play on one’s existing strengths and personal interests. If you already have a Master’s degree in business, you are likely to qualify highly as a reference librarian at a business school. If that also matches with your interests, why not pursue reference-related work experience while at school? If you have teaching experience as a teacher or a tutor, you must have quite a bit of knowledge about lesson plans and learning objectives which are important elements in library instruction. So applying for an instructional librarian position emphasizing this asset of yours would work favorably. If you tend to catalog every CD, DVD, and book that you own, probably you are already half way to becoming an excellent cataloger or metadata librarian. So make sure to engage in real-life cataloging at libraries beyond one or two classes at school. 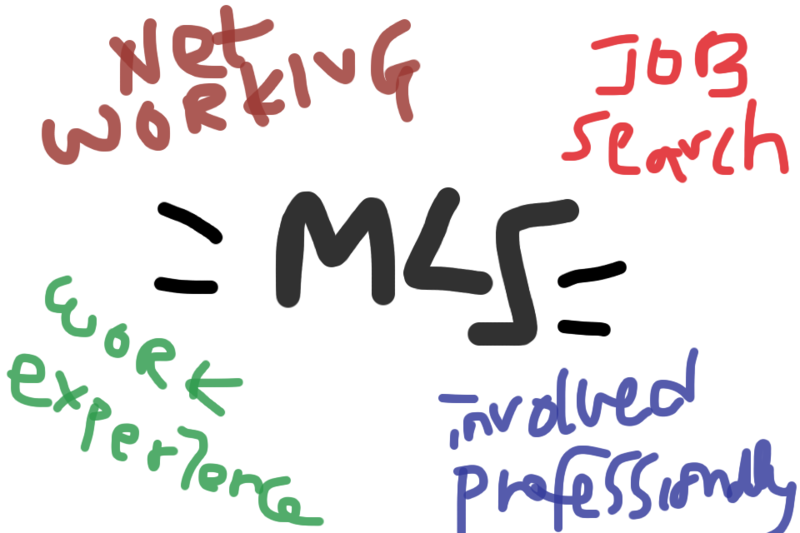 It goes without saying that networking and active professional involvement during your MLS education will benefit your job search. Even more benefit would be gained if you attended professional conferences, presented, got a scholarship, and/or published an article. But due to the constraint of time and the tight budget, many MLS students are simply unable to fully participate in these activities. But guess what? If you love working at a library, you can still build a solid foundation for getting a job after the MLS through the work itself. After all, one cannot do everything but what it matters is at least trying the best one can. I think this is a really useful post, that says a lot of stuff that many ‘how to get a job’ type guides often neglect to mention. The whole ‘doing the kind of work that one “wants to pursue” after the MLS’ thing is particularly underestimated in terms of importance, I think – that applies to any field. When I started my degree I just thought it was good to get work experience – actually, to get any kind of decent job nowadays, you need to basically prove you can already do it. So targeted work experience is pretty essential. Also the existing strengths and interests thing is great – we’ve organised a whole conference in the UK (http://bit.ly/bmcsNN) around the theme of how library and information work, perhaps surprisingly, allows you to pursue your existing passions in your job. It’s part of what makes it a vocation for so many of us. Thanks for the comment! I know that there are many posts and a lot of advice about how to write a cover letter and resume and how to prepare for an interview. But I wanted to talk about what worked the best for me( particularly because I couldn’t do much beyond my full-time job while at an MLS program): going after what I wanted to do and learning it through work. Since so many MLS students struggle with balancing work (often full-time) and study, it’s best to make the work an ally to LIS study and it is not difficult to do so since LIS is such a practical discipline. Thank you for sharing this. Reading this put me at so much more ease. I am just about to graduate in December and like you wrote, I worked full-time and was not really able to publish articles or attend all the conferences because of obligations. I have to admit I am worried because I am starting to apply for positions. While yes I have been working in a library, I still worry whether or not my experience will be enough to get me in the door. You really provided a lot of helpful information. Thanks so much! Well, my input here is only debatably useful as I’m still looking for that first post-graduation job, but I really feel what you’re saying about the difficulty of getting involved while in school. In my case it was childcare constraints, not work, but either way I wasn’t able to be involved in student groups the way I want to, and it was simply unrealistic to get much library work (it all paid less than childcare cost). Dealing with this could be frustrating but my mantra was “a constraint, not an excuse”. Andromeda, thanks for reading this post and writing up a great new post on this topic! It is true that some of the things that we have to take into consideration in our professional lives are constraints, not excuses. All of us have different obligations and priorities and have to balance those with our professional lives. And it is no easy task. There is no one uniform path to the first librarian job. You make a great point!